We stand and eat breakfast, huddled like horses, at camp Pig Farm. Marisol, our guide who comes from Guyana, explains the perils of the day. The ascent will be straight up, and we need to climb with our hands. Be careful placing hands on rocks, branches and wet clay, as there are two highly venomous snakes, the coral and the dangerous and more common Macagua snake, a name often used to describe a very mean woman. A hiker was bitten just two weeks ago and had to be carried out by porters… he is still in the hospital. Off we go…climbing what I call the ladder, a straight-up slope of wet, slippery clay. Impossible to watch every step, or hand placement because the weight of backpacks can pull you off balance and nobody wants to fall backwards. 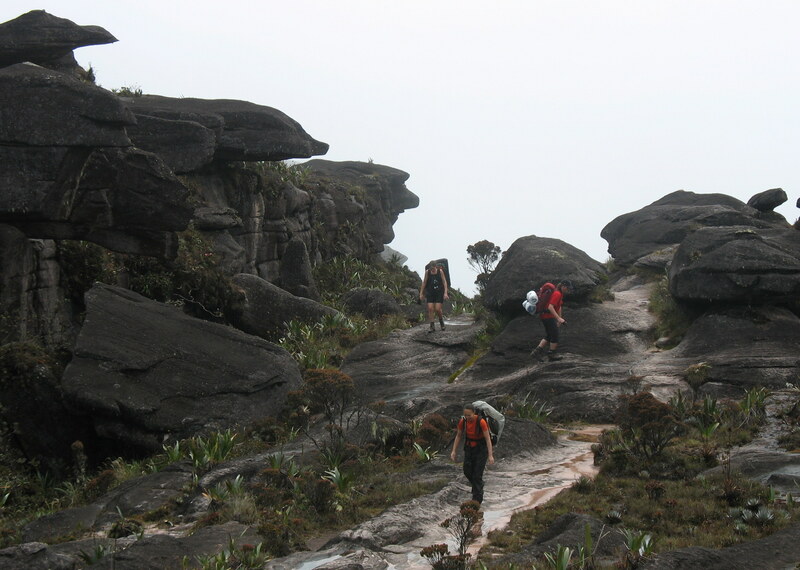 Our hearts pump hard, sweat mixes with rain on our bodies while we enter a dense rain forest. The trail crosses many streams and high grades followed by a few downhill slopes. Because of torrential rains, we scramble over loose rocks and under two separate waterfalls that pound us with surging cold, freshest of the fresh, water. 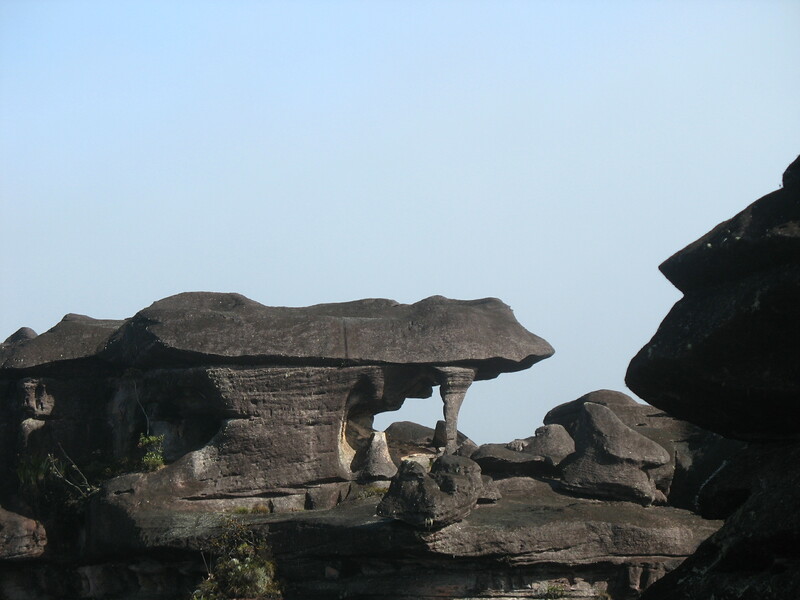 Immediately we see the bizarre rock formations that inspired Sir Arthur Conan Doyle’s “The Lost World.” Porters pitch tents on platforms at the edge of ledges. 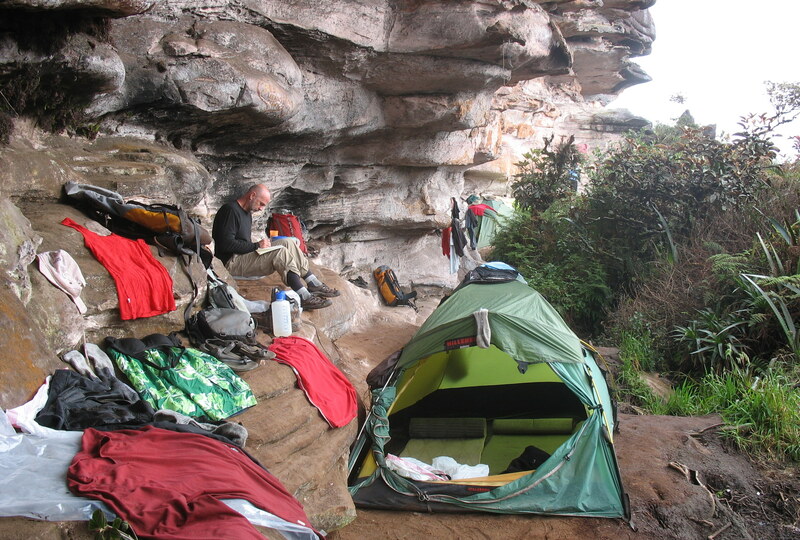 Our “hotel” Sucre has a sedimentary overhang that protects us from the rain, for which we are grateful, as our tent will not close, the zipper is broken. Mare and I huddle in the cold night wearing the last of our dry clothing hoping that the snakes, spiders and mice stay away. 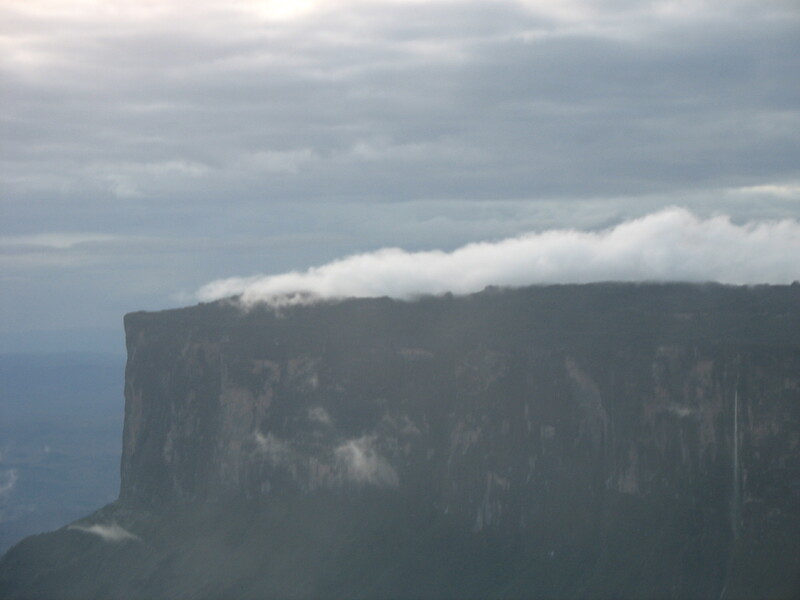 Our group explores the top of this tepuis, a table mountain formed by warping of continental plates. Laughter saves us from focusing on sore bodies and the stench of clothing that seems to ferment. Marisol guides us past carnivorous plants, their small pedals holding insects. 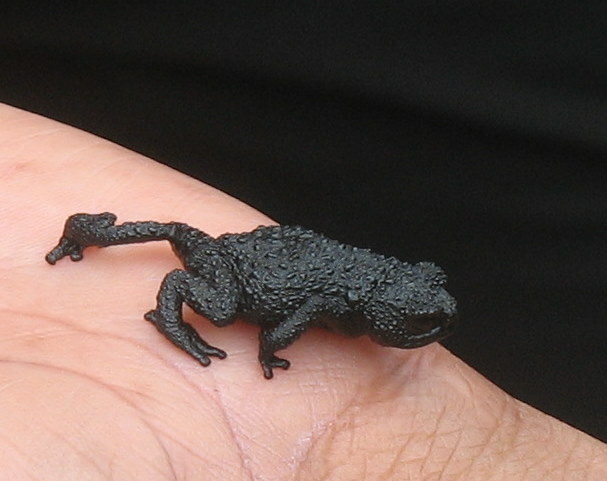 Tiny black frogs crawl instead of hop. 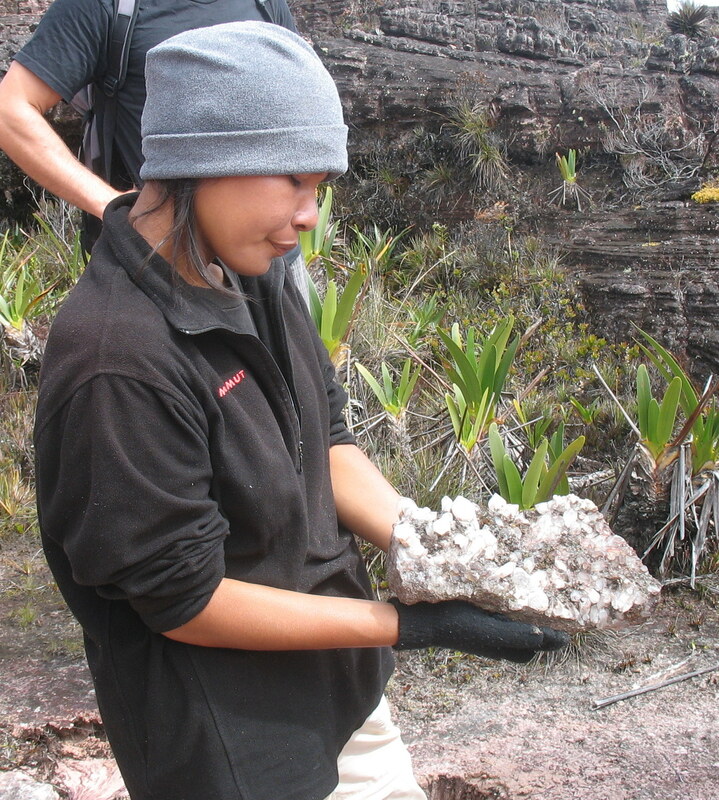 They are endemic to this lost world of black, mold-covered limestone, along with about 1,000 species of endemic plants. It’s two o’clock and we are starving as we walk through a valley of quartz crystals. Crystals are everywhere and we are reminded that nothing is permitted to be taken from the mountain, and bags will be searched at the end of the hike. 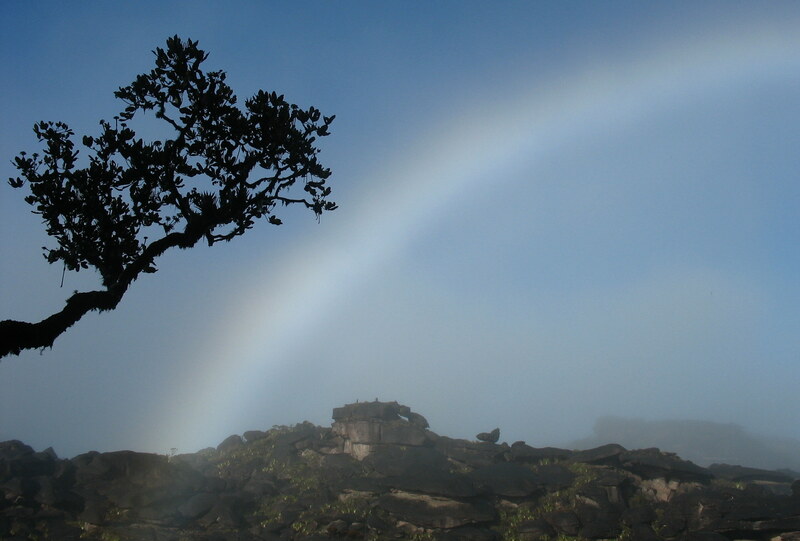 We look through the “window,” an edge of the mountain, and see nothing but mist and clouds below. At the quartz-lined ponds called Jacuzzis only a few hikers are brave enough to dunk into the cold water. I just finished reading “The Lost City of Z” by David Grann about exploring the Amazon in 1925. It references Conan Doyle. Be sure to read it. Dom, looks can be deceiving!